Now they’re doing the same thing with Proposition 112. Proposition 112 mandates that new oil and gas development, including fracking, be a minimum of 2,500 feet from occupied buildings, like homes, schools, hospitals, and other vulnerable areas, like playgrounds, sports fields, amphitheaters, public parks, drinking water sources, etc. Yes, the measure would only apply to new oil and gas development, not to existing well or fracking sites. Despite this, the drilling industry is screaming that it will result in a de facto “ban on drilling” throughout the state. This is far from true, especially since so many active wells currently exist, and because advances like directional drilling allow companies to drill many wells from one location. All Prop 112 seeks to do is have industrial activity kept a safe distance away from where people live, work, go to school, recuperate, recreate, get their drinking water, etc. It’s done every day with other industries in cities and towns throughout Colorado through the use of zoning laws that keep residential areas away from industrial areas. 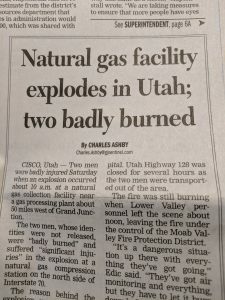 It’s nothing new, and there’s no reason why the drilling industry should be exempt from this same type of separation to preserve public safety. Prop 112 is a common-sense measure designed to help keep the public away from common devastating drilling accidents, like fire, explosions and toxic spills. 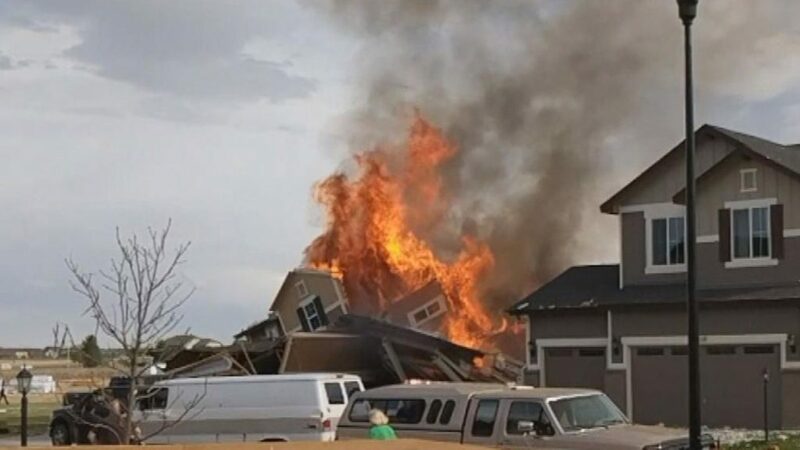 One of the stimuli leading to Proposition 112 was the devastating explosion in a subdivision in Firestone in April 17, 2017 that killed two Colorado residents in their home and sent others to the hospital. 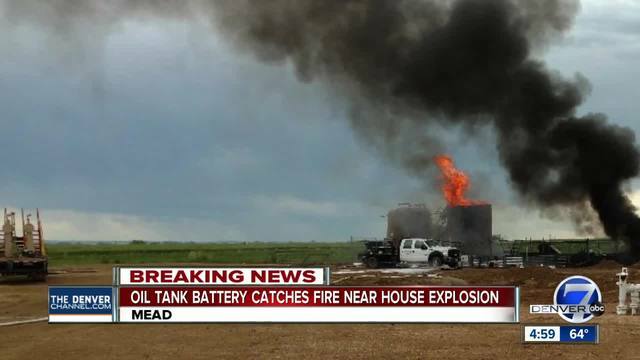 Since then, a slew of other oil field mishaps in 2018 alone have caused injuries and environmental damage all over the state, including explosions, fires and toxic spills into waterways. According to the Colorado Oil and Gas Commission (pdf), toxic spills from oil and gas activity more than doubled in the state between 1999 and 2013. All of this makes the need for Proposition 112 even more urgent, and since the state hasn’t acted to preserve public health and safety from drilling mishaps, Colorado residents did it on their own through a ballot initiative. These end-of-the-world predictions just never pan out. Over and over, we’ve been handed the same panic-stricken, hyperventilating threats by big business interests that if voters approve some public safety measure that it will devastate our economy, lead to the loss of thousands of jobs, and ruin our lives. It’s the same on the flip side: They also promise glorious fortune if we just vote for all the stuff they want us to vote for. Our local chamber of commerce consistently jumps onto both of those bogus bandwagons. But the predictions they make never come true. In 2013, the Grand Junction Area Chamber of Commerce promised voters if they approved a ballot measure to rezone land by the Colorado River to light industrial to allow Brady Trucking to open a headquarters there, a slew of high-paying “jobs and trails” would come to Grand Junction. Citizens listened to the chamber’s BS and approved the re-zone, but the land still sits fallow and Brady Trucking never built anything there — no jobs, no trails, no nothing. In 2016, Diane Schwenke, president of the Grand Junction Area Chamber once again implored us to vote against Amendment 70 to raise Colorado’s minimum wage to $12/hour by 2020. 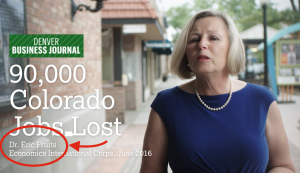 In TV ads Schwenke very sincerely warned that the measure would devastate Colorado’s economy and “cost 90,000 jobs.” Schwenke’s “90k jobs” figure came from Eric Fruits, an adjunct professor in Oregon, who worked out of his three bedroom home part time as an economic consultant and who was also a part-time Uber driver to supplement his income. Voters defied the chamber and passed the minimum wage increase by a wide margin, and what happened? It’s been two years since the measure passed, there have been two incremental increases in the state’s minimum wage so far, and guess what? Colorado is continuing to prosper. In it’s September 21, 2018 issue, a Daily Sentinel headline touted “Colorado continues to prosper from economic boom.” So far there has been no perceptible net loss of jobs from the minimum wage increase. Rather, it’s been the opposite — Colorado’s economy is booming. The chamber’s screams and threats of economic devastation and job loss were just more BS, just like the drilling industry’s claims about Proposition 112. We’ve been here so many times before. In 2006, Big Business warned Coloradans if they passed a smoke-free workplace law at the ballot box it would put thousands of bars and restaurants out of business and cause economic devastation, job loss and desperate times. Restaurateurs and bar owners shivered in their boots, and tobacco industry-funded TV ads hurled predictions of mayhem, misfortune, destruction of the state, the whole nine yards, like we’re seeing now from the drilling industry. Citizens defied Big Business and passed the smoke-free law by a wide margin, and what happened? Restaurants, bars, theaters and other public venues went 100% smoke-free and everyone loves it. Employees, employers, customers and patrons alike are happier and healthier, the economy is booming, people are going out more than ever and no one even thinks about smoking inside public places any more. Colorado moved forward and life improved for everyone. Again, the doom-and-gloom predictions from business didn’t pan out. Big Religion made similar horrific predictions in 2016 about Proposition 106, the End of Life Options Act. They predicted people would use the law to kill disabled family members, that family members would coerce other family members to die so they could collect on their estates, that people at the end of life would be too confused to decide to end their own lives. None of that has occurred, and last year 57 people were able to avoid unnecessary suffering at the end of their lives thanks to the law. They made terrible predictions about Amendment 64, too, the measure legalizing marijuana in Colorado which passed by a significant margin in 2012. It ended up contributing greatly to Colorado’s economy with far less down side than scaremongers predicted, and made Colorado a leader in creating a legal infrastructure to sell recreational marijuana. Cities and towns across the state are realizing additional tax revenue from retail pot stores and using it to improve their sidewalks, sewer systems and other infrastructure. The wild predictions of disaster they said would happen from these measures just never materialized. So don’t believe “Protect Colorado’s” BS now, because it’s just another wealthy front group for oil and gas companies who don’t care about your health or safety at all. That the only mandate guiding for-profit companies is that they must act solely to improve their own bottom lines and generate wealth for their shareholders. They do not concern themselves with improving public health and safety, just keeping costs down. These companies are spewing fear-based whining and trying to convince you not to take action to improve the safety of our communities and the health of our citizens. Instead, believe your common sense and feel free to vote for ballot measures brought by actual Colorado residents to protect you and your family’s safety and health. I also find it disappointing that you provide no data to refute the projected job losses and economic damage that could result from Prop 112. Your data points are not even related to oil & gas; you just cite random instances where random people turned out to be wrong about random things. Common sense tells us that if you put 80+% of non-federal land off-limits to new oil and gas development, there must be some economic downside, but you chose to ignore that completely. This lack of data is a common thread among arguments advanced by the Prop 112 crowd. This is unfortunate, because we need better regulations that actually take the economic downside into account. I’d gladly vote for a common-sense idea like different setbacks for different situations. For example it makes no sense to have the same setback from a school in Erie vs a seasonal stream out in the middle of uninhabited Weld County, but Prop 112 mandates the same setback for both. This extreme, one-size-fits-all, non-data-driven approach is why Prop 112 will be defeated. Hopefully we’ll get a more sensible measure to vote on next time around. Mr. Brandon. do you know the radius of a blast zone for a rig? Do you know the concentration of methane required to meet toxic levels for breathing? Do you know the noise decibel levels required to damage a first grader’s hearing? Do you know the PM level that cannot be evacuated from the lungs of a human? Do you know what proprietary means? Ms. Landman does not have to prove that a 2500 setback is safe. Common sense, familiarity of the process of a well head development, its extraction of product, the act of using millions of gallons of potable water, forever removed from the cycle of water, the lack of true remediation of all wells, well sites and pipeline capping in a safe and permanent manner, dictates that the O&G industry is NOT consistently professional and ethical in their work. “Ms. Landman does not have to prove that a 2500 setback is safe.” No, she has to prove that any health benefits of a 2500 setback would be worth the economic downside, if she wants anyone to vote for Prop 112. She also has to prove that the same 2500 ft setback makes sense for a school in Erie vs a seasonal stream in uninhabited Weld County. That’s an impossible case to make. “This nation has NEVER expected nor even requested that companies do that.” “Since O&G is the regulated industry,” Contradicted yourself there. Which statement is true – the US has never expected O&G companies to improve, or O&G is a regulated industry? They can’t both be true. “Why should the taxpayers/citizens not be able to ask for some better measure of safety?” We should. But Prop 112 is the wrong answer. Why should I address your questions when you ignored ALL of mine? You think that industry has your health and safety as a priority in their planning. I gave you what you requested from Landman…access to peer reviewed studies on what O&G development means to community health. That means the health of all things required for life under Maslow’s theory. You did exactly what I told you you would do…ignored the access to facts. It is hard to open ones mind to facts that shakes the foundation of your belief that MAN NEEDS EXTRACTION. HA! I do agree, as I said, the 2500 ft setback is not the answer. But you offer nothing except to repeat your assertions about the setback. Do you not see how inundated communities are so desperate for relief that they will grasp at this small measure of regulation? This will cost companies a tiny amount of their profit but a proliferation of jobs for Pipefitters, Ironworkers, surveyors, O&G planners, etc to develop well heads as advantageously as possible, something that should have been done from day one. Instead, a board of unelected officials have been “regulating” these placement. They have never turned down any well development, even in city parks. Palisade is now in the crosshairs. You can answer or not answer whatever you want, but you might wanna read my original post again. I did not ask Landman for peer reviewed studies on the health risks. I noted that she chose to completely ignore the economic downside, and she provided no data whatsoever on THAT issue. You’re answering questions I never asked. There is a human cost to unemployment. There is a human cost to defunding schools. There is a human cost to defunding state services that people rely on. Take away $9B in O&G tax revenue over the next 10 years, and the state either needs to stop providing those services or raise our taxes. This is not as simple as “the O&G industry doesn’t care about your health interests.” The industry and related industries employ a lot of people and pay a lot of taxes. Landman’s post pooh-poohs that, the Prop 112 crowd in general ignores it, and you’ve continued to ignore it in your replies to me. Many industries — restaurant, hotels, retailers, etc. — predicted a severe economic downturn if we ended smoking inside businesses. It didn’t happen. They said an increase in the tobacco tax would devastate the economy. It didn’t. The beer industry said marijuana legalization would devastate the state. It didn’t happen. The Chamber of Commerce warned that increasing the state minimum wage would cause the loss of 90,000 jobs (the estimate of a part time economist/Uber driver in Oregon), and it hasn’t happened. 0We have to laugh now, looking back at all the “chicken little” predictions they spewed about every measure that they thought threatened them. The “economic downturn” ruse is now an old scare tactic that has been used over and over by big businesses to try and get us to do their bidding, and it hasn’t panned out. It’s lost it’s effectiveness. Yeah, you said all that before, and it’s no more convincing the second time around, because it’s not relevant. My mom told me I’d go blind sitting close to the TV. Turns out she was wrong. Does that mean I should ignore my mom? RELEVANCE, please. You had me until the drinking water sources part. Yeah, just throw that in there at the end after the long list, hoping people won’t even make it that far, let alone think about how no-growth, flat-Earth environmentalist wackos will make the case that every location in the state is a drinking water source and then, yes, it will be a de facto ban on drilling in the state. So yeah, I’m voting against it. I’d say the fears are real. Mr. Jeffries, the oil and gas industries use 6-10 million GALLONS of fresh water per frack. That alone cuts into the total volume of water available through Nature’s wonderful cyclic system that we as humans, rely on. “Flat Earth” environmentalists is not an insult but a laughable statement in the face of scientific data regarding O&G processes. Ask Palisade and the community about how they now feel to have “leases” up for grabs at their doorstep. Those leases, if sold as is, will inundate this valley with the same pollutants that Rifle, Longmont, and all other communities have had to deal with because the industry continues to shortcut their responsibilities for the love of the profit. All spills, blowouts, seeps, contamination, gas releases, etc. are preventable. The industry has NEVER had to pay the consequences. The uranium industry is a good example of lack of corporate conscience. By all means vote against your and your progeny’s best interest. Denigration of your life is meaningless…right? I could give you access to peer reviewed studies to prove my point, but you would NEVER read them. They are scary and specific. They are a warning that oil and gas industries are not and never will be good neighbors until they are forced too. The sad thing is, I have been in the most intense oil and gas fields and communities in the world….Ras Tanura Saudi Arabia. As an RN, and researching, working in the industry, and now understanding the health and safety issues, I know it can be done better. We just have to make them do it. So I guess my vote will cancel yours. Track Palin – more domestic abuse last night! It can’t be – there are no violent Christians!!!!!! Haha. DWTS STARS JUNIORS. Lil Tripp Palin got booted off 1st week! Boot that racist xenophobe 9 year old off TV! More time for him to hang out with his whore mom. Diane Schwenke sounds like a nightmare. Let’s hope she doesn’t have kids that she has pawned her fear off onto. Kids are so messed up because of unskilled and ignorant parents not living in accord with nature. Thanks big religion, with your error of separation of man, nature, and god: they are all words for the same thing. It is this separation which creates the fear in Diane. The separation is her fear. Shhh – don’t tell Diane, she has everything already invested in the error! Thanks, Anne. Every new well is a slap in the face to our grandchildren, telling them that we don’t give a damn about their quality of life. Currently, we need natural gas to power our Colorado lifestyle. But Oil and Gas consortiums want to ship OUR gas to Asia via Jordan Cove. So we suffer all the methane leaks and pollution and Asia gets our gas. Conservatives and progressives should come together and say OUR natural gas stays HERE! I may have not looked deep enough, but the anti-112 being put out by the “ironworkers’ ” union is not mentioned on their website that supports that supposed stand. I could not understand why the ironworkers union would put out an anti-112 advertisement. Even if the setbacks were 2500 ft, it would mean more work for ironworkers. If fracking were strictly regulated or seized altogether, renewables will be a boon for the ironworkers. If their leadership does not understand that, then they need new leadership for the 21st century. Thanks for all the previous Chicken Little examples! They definitely make your point! On a similar note – Republicans often scream, “But your taxes will go up!” as if that were a horrible thing. They never point out that taxes pay for universal services that benefit us all at non-profit prices. (Then they go after Social Security and Medicare to pay for the tax cuts.) I am going to Share your post on FaceBook. Well done. A Masterpiece of common sense ! Well done, Anne. .I had the same.thoughts, but you expressed them so much more precisely.